Removing stains can sometimes seem like a complex algebra problem. By the time you determine the stain type, origin of the stain, fabric type and color scheme, you can feel pessimistic about stain removal. Try these 10 simple stain removal rules to get your laundry in shape. 1. Act quickly: Fresh stains make stain removal an easy task. 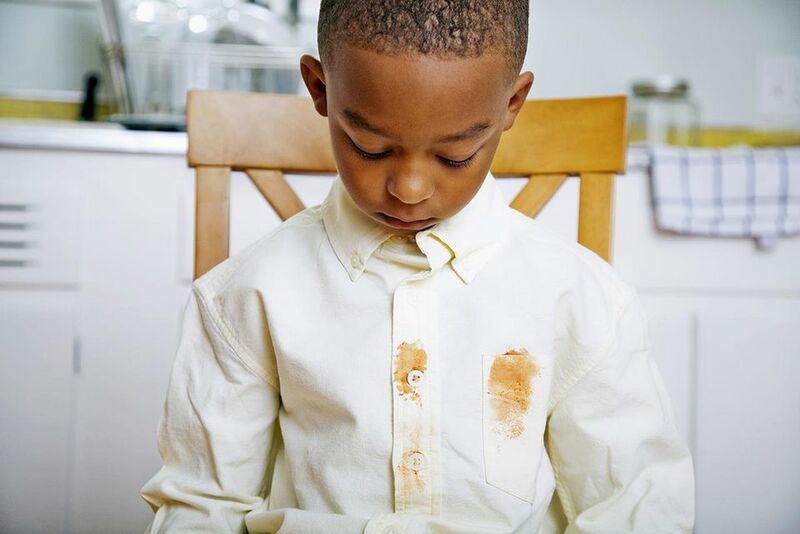 Give yourself the upper hand by treating stains as promptly after they happen as possible. If your stains are on a non-washable fabric, take them to the dry cleaners as soon as possible. Be sure to point out the stain to the dry cleaner and describe the nature of the stain. This makes the likelihood of success greater. 2. Follow the directions: Follow the directions on any stain removal products you use. Don't forget to follow washing directions on the stained clothes. Getting the stain out, won't make much difference if you ruin the clothing in the process. 3. Test in a hidden area: Don't forget to test any stain removal methods on a hidden seam or another inconspicuous spot. Check for colorfastness before applying a treatment to a large or noticeable area of the clothing. Do not use if the color changes. 4. Remove stains from the back: Place the stained garment with the stain upside down on top of a clean white cloth. Apply stain treatment to the back of the stain. Our goal is to remove the stain from the clothing instead of making it travel all the way through to the other side. Make sure to move the stained clothing to a fresh spot as the stain begins to remove itself from the clothing and onto the cloth. 5. Be careful with dry cleaning solvents: Make sure to rinse thoroughly, and allow to air dry any garment that's had dry cleaning solvents used on it. These solvents can be a fire hazard in a washing machine. Remember never to put dry cleaning solvents directly into the washing machine. 6. Be wary of color removal with bleach: Bleaching only one stained spot on a garment may result in uneven color removal for the entire garment. Consider using the appropriate bleach listed in the garment tag to bleach the entire garment. 7. Don't mix stain removal products: Mixing different chemicals can cause toxic odors and mixed results on your clothing. 8. Wash stain treated items: Remember to thoroughly wash items that have treated with stain removal products to remove product residue along with the stain residue. 9. Be patient: Stain removal can take time. Sometimes repeat treatments may be required. Be sure to thoroughly check the garment before drying to determine if a repeat treatment is necessary. Drying will cause a stain to set. 10. Some stains are permanent: For some stains, no stain removal idea or tip can get rid of them without damaging the clothing or its color. But take heart in the fact that the other 9 general stain removal tips will give you a fighting chance against all the stains in your laundry basket. Just a few simple guidelines can take the guesswork out of stain removal.